Rooting voids your warranty. Not following the instructions carefully might result in a bricked phone. Proceed at your own risk! Step 1: Download and install Motorola Drivers for your Windows PC (this doesn’t work on other operating systems): 32-bit or 64-bit. Step 2: Download DooMLoRD_v2_ROOT-zergRush-busybox-su.zip and extract contents to your PC (desktop would be a good place). 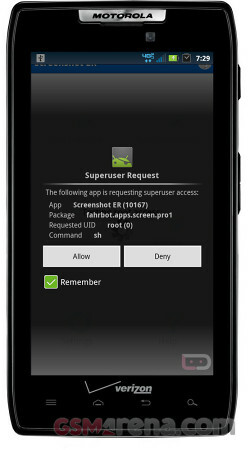 Step 3: From your Droid RAZR’s homescreen, tap Menu button and enable USB Debugging from Settings > Applications > Development. Step 4: Connect your Droid RAZR with your PC and select Charge Only option from notifications drawer. Step 5: Navigate to where the folder you unzipped in Step 2 to and open the folder and click on the runme.bat file and let it do its thing. You only need to do this process once.